When you’re looking to install sliding glass doors in your home, one of the first decisions is often how you will use the window. Do you want to have a door to access your yard or terrace? Do you want a large window that allows you to open panels to let fresh air into your home? Or would you prefer to open the panes completely to remove the barrier between interior and exterior? With Cover Glass, you receive all the above in one. All our sliding glass doors offer four different glass opening combinations: completely open, partially open, with air gaps, and closed. 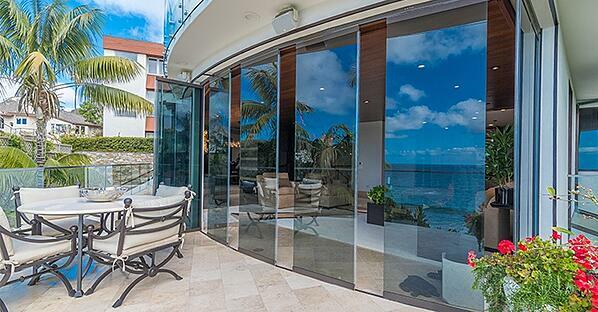 The seamless performance of the sliding glass doors means it is easy to switch between each option. When your glass doors are open, you have uninterrupted access to the outdoors. The great thing about sliding glass doors from Cover Glass is that the panels stack one on top of the other, either inside or outside. Unlike other designs, this leads to a completely open space. Plus, you can choose if you want the panels to stack to the right, the left, or both — whatever best fits your home layout. As the glass is either ½ inch or ⅜ inch double thick, even if you have many panels, they take up very little space. Plus, the panels automatically magnetize and lock into position when placed on top of each other, leading to a tight fit. Partially opening the panels allows your window to act as a door. This is perfect for when you need to slip out or when you want to create a connection between inside and out without opening the space completely. For added convenience, you can open whichever panel you want. This means that, even if there is someone sitting near one of the panels, there is no need to ask anyone to move. The air gaps option is ideal for refreshing your home or letting in a breeze instead of relying on your air conditioning. This is perfect for maintaining an intimate space as well as avoiding dust or too much wind from entering your home. Of course, you also need the option to close your sliding glass doors. When closed, the panels are completely secure. 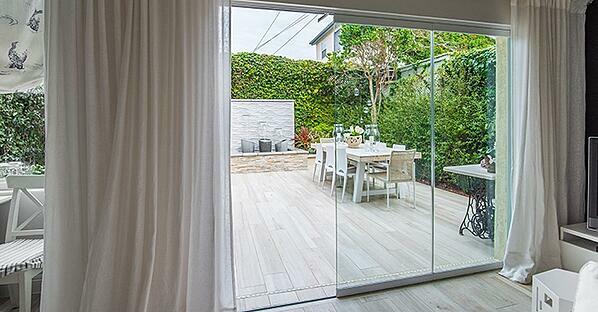 Unlike other sliding glass door designs, it is impossible to push the panes off their tracks. 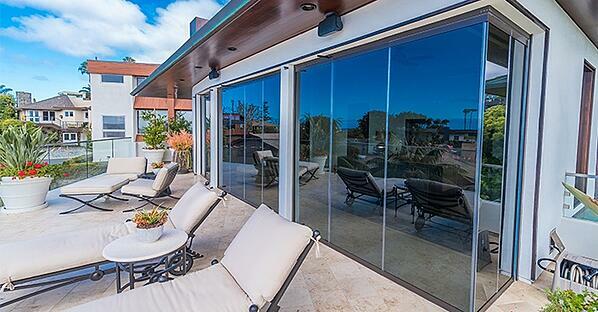 Another way Cover Glass sliding glass doors maximize security is through their locking systems. The standard option is to open only from the inside, but you can also choose to have a lock on the outside — whatever suits your lifestyle better. As our glass doors are frameless, they offer unbroken views when closed and allow natural light in to brighten your home. If you want to avoid too much UV light from entering your home, opt for Low-E glass. This will protect your furnishings from fading and stop your home from heating up. Our versatile windows provide optimal beauty and comfort. They allow you to adapt your home for different occasions and weather. For instance, if you’re holding a large party and want to increase the sense of space, you can leave the doors completely open. You also have the added value of sliding glass doors that glide smoothly open. 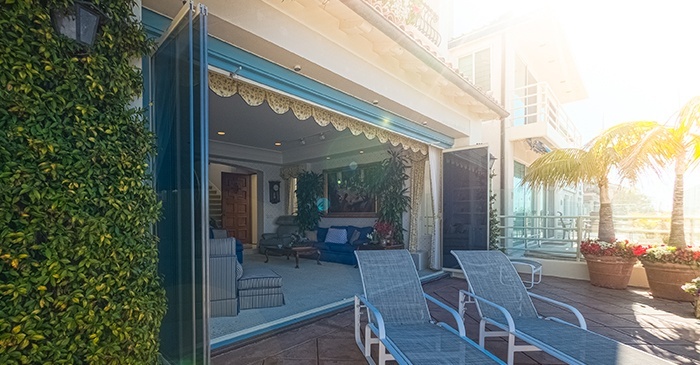 However, the benefits of Cover Glass sliding glass doors go beyond versatility; they are designed with durability, aesthetics, and customization in mind. For instance, the glass is five times stronger than standard glass, meaning it is virtually unbreakable. It can even withstand extreme weather conditions, including winds of up to 222 miles per hour and heavy rains. One way to customize your sliding doors is to choose the color of the glass. Your options are clear, gray, green, light blue, dark blue, and bronze. We also offer special reflective coats. Another customization option is fully recessed tracks that sit flush with flooring. This means there are no uneven surfaces and nothing to step over when the doors are open. 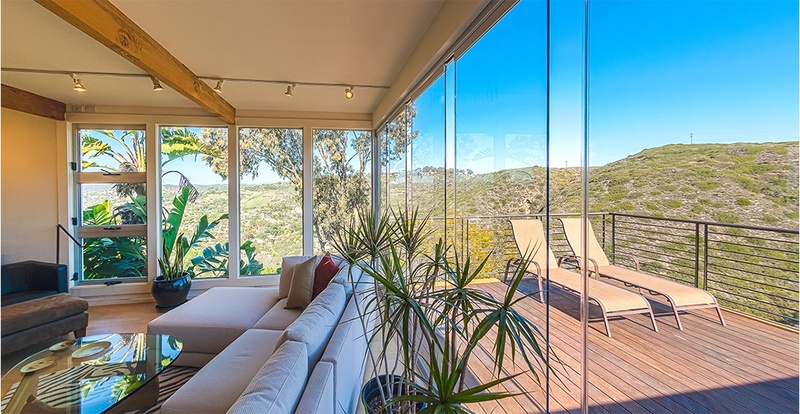 Even if you use your sliding glass door for mostly one or two opening combinations, it is worthwhile to have the flexibility offered by Cover Glass. For one thing, this means that you’ll always have the option to change how you use your doors, such as if your circumstances change or if you want to hold a special event. Furthermore, having various glass opening combinations increases the appeal of your home to prospective buyers. This both increases its value and reduces its time on the market. In other words, choosing sliding glass doors with four different glass opening combinations is a great long-term investment that you family can enjoy from the moment we finish installing the system.